Camp DSE-204 was on the edge of Lake Andes only 0.6 mile from the main part of town and 2 blocks from the baseball field. As its designation indicates, it was a drought relief camp. Though it appears that a company of Nebraskans was at Lake Andes in 1933 and again in 1935, only the history for 1934 was located. 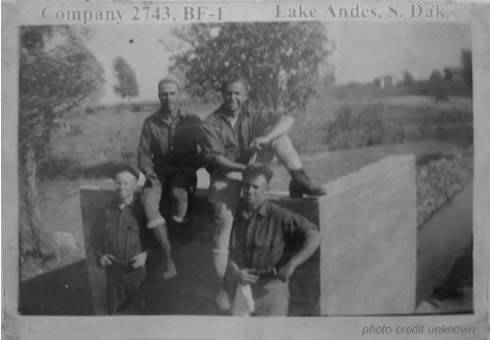 Company 2759V, the second company of WWI veterans to be organized in South Dakota, was at Lake Andes from July 31 to November 1, 1934. It was then transferred to Camp F-20 (Park Creek). 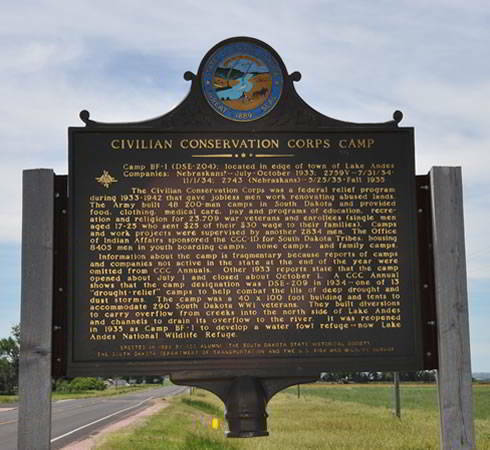 The company was organized at Camp F-17 (Calcite), Tilford, SD, the home of the only other veterans company in the state, in July 1934 (1935). On July 16 orders were published sending the company to Lake Andes with movement to be made not later than August 1. Lt. Goodwin was assigned immediately to the new location for the purpose of providing necessary conveniences for the company upon its arrival. There had been a CCC company at Lake Andes during the summer of 1933, and a mess hall, bath house, and latrine had been constructed (1935). The company entrained July 30 for its new home and assignment. It left in a 10-coach train from Tilford on a hot July afternoon. The next day at Lake Andes, it was greeted by the city mayor, the contact man, the usual corps of city folk, and a still more torrid climate. The special train came to a stop at 12:50 p.m., and by 3:45 that afternoon all men, supplies, and equipment were in the camp area (1935). Though the country experienced a complete crop failure, the weeds had done well and were shoulder high in the campsite. The next few days were spent policing and organizing the area into a tent city for 290 men (1935). The Black Hills area was experiencing unusually hot weather, but the men soon discovered that more heat had been turned on. The first Saturday at Lake Andes (August 4) the thermometer registered 115 in the shade--and "no shade." It is said "the first impressions are the most lasting." Certainly the first impressions at Lake Andes would be long remembered. The water was distasteful and the fragrance from the lake was less desirable. However, that hot Saturday destroyed the distasteful odor from the lake (1935). The mess hall and kitchen was 40x100-ft structure built of native cottonwood lumber with iron roof and gravel floor. It also quartered the camp exchange, orderly room, and part of the supplies and equipment. The hot water system consisted of an old 40­horse Minneapolis steam threshing engine that had been honorably discharged from duty about the time of WWI. The engine served its purpose after all the "bird nests" had been cleared from faucets and showers. The leak flues were a daily source of annoyance to the fireman, but the water was ample, warm, and wet (1935). The barber shop was a movable structure consisting of a crudely made cottonwood stool, a GI can, and two saw horses. When the shop was crowded the customers stood up while the barbers sheared their standing customers. Weather conditions (principally composed of sun, wind, and shade) determined on which side of "Dad" Amundsen's hog house the barber shop would be. Crude and inconvenient as it may have been, the members had their ears lowered for 15 cents (1935). It seemed that the men had hardly settled when word arrived that 2nd Lt. Dean R. Morley had been assigned to the company, but was on detached service at a campsite near Galena in the Black Hills known as Camp F-20. It was to be the winter home of the company. There was much speculation as to when the move would be made. Finally on October 3, word was received to the effect that the move would be made November 1, 1934 (1935). November 1 came, and the company returned to the Black Hills in an all-steel 12-coach Milwaukee train. The transportation officer at Fort Meade met the train at Sturgis before sunup on the morning of November 2 with a fleet of 21 trucks. At 10:00 a.m. personnel, supplies, equipment, and baggage were in Camp F-20 (1935). The work project at Lake Andes consisted of diversion and drainage. Creeks to the north were diverted to send their flood waters into the lake, and on the southwest shore a drainage project leading to the Missouri River was under construction to dispose of any overflow or excessive high water in the lake (1935). 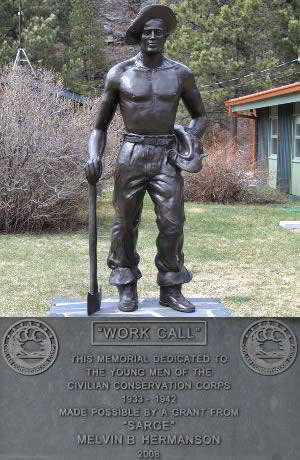 The Civilian Conservation Corps was a federal relief program during I933-l942 that gave jobless men work renovating abused lands. The Army built 48 200-man camps in South Dakota and provided food, clothing, medical care, pay and programs of education, recreation and religion for 23,709 war veterans and enrollees (single men aged 17-25 who sent $25 of their $30 wage to their families). Camps and work projects were supervised by another 2834 men. The Office of Indian Affairs sponsored the CCC-ID for South Dakota Tribes, housing 8405 men in youth boarding camps, home camps, and family camps.